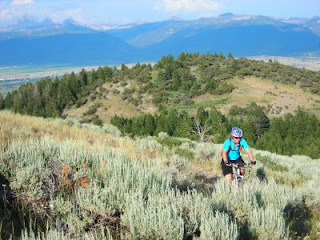 It was a weekend of only-in-July variety around Driggs, with perfect conditions for every type of recreation. 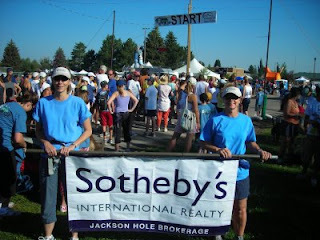 We took advantage and got out mountain biking, horseback riding, running in a local 5K charity race, and more. Man, I wish we had more than one July. Saturday morning was the Tin Cup Challenge, a 5K/10K/Half-Marathon/Marathon event benefiting local Teton Valley, Idaho non-profit organizations. Turnout was robust; it appeared half the town of Driggs was there...yes, at least a couple hundred people! ;-) So, it was fun seeing lots of friends, many with their dogs in-tow (we saved Bridger's energy for later in the day). We eased through the 5K, socialized, and made it home for a break before the next activity. I make it a habit to ride horses at least once a year, whether I need to or not. It's mainly Joanne's hobby, but I grew up around horses, we feed them all winter and I do enjoy it once I'm out there. 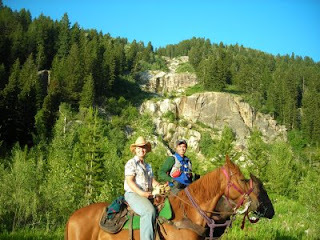 So, Saturday evening we joined do-it-all-Dan for a great trail ride up the South Fork of Teton Canyon, towards Alaska Basin. Wildflowers, rushing water, blue sky and rugged high country scenery made for a magical few hours. My young steed Colter did great, and I even rode out a brief bee-induced rodeo moment that kept me awake out there. After watching the Tour de France Sunday morning (I'm addicted to that event, love the aerial scenery almost as much as the race...which enters the Alps this week! ), we headed out on the mountain bikes. I'm finally starting to feel my fitness kicking into high gear, that old feeling of cresting a long, technical climb and actually wanting more. I love it. 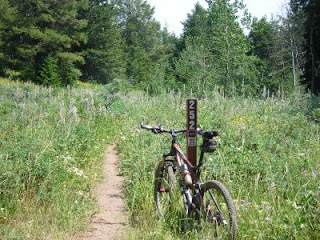 As usual, the local singletrack trails were nearly empty. It's amazing, but as the population of Teton Valley grows, the backcountry trails don't seem to get any busier. I think everyone's busy texting, which is totally fine with me. Leaving you with a July-appropriate link to the singular, everything's-gonna-be-allright Bob Marley. Enjoy summer, y'all!